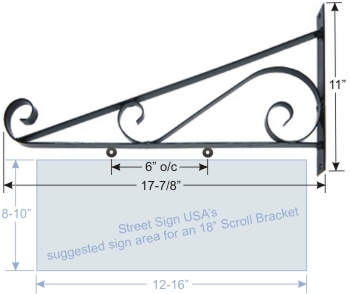 Decorative Scroll Bracket For Hanging Signs - 18"
Deluxe Decorative Twisted Scroll Bracket For Hanging Signs - 36"
Decorative Scroll Bracket For Hanging Signs - 24"
Our decorative wrought iron 18" scroll bracket comes complete with S hooks for mounting any sign up to 16" in length. 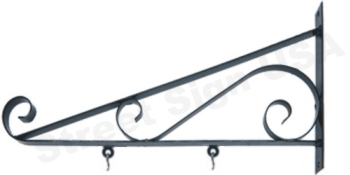 Bracket can support any wood, metal, plastic or carved sign up to 15 - 20 pounds in weight. Bracket has pre-drilled holes on back which can bolt or strap to a wall. This vintage style decorative scroll bracket will highlight any carved wood, metal or plastic sign! Scroll work is made of 3/4" wrought iron. Bracket is sold in black and can be painted by you to match any particular color scheme. 2 centered mounting holes on an 1-3/8" welded backplate allows you to fasten to any wall, indoors or out. Includes S-Hooks for fastening the sign to the bracket. Additional hardware required for mounting the bracket to a wall.